The Japanese Beetle (Popillia japonica) is a pest of hundreds of ornamental and native plants. Both adults and larvae cause damage. Surveys are conducted because of the presence of potential host material in Wyoming and potential introduction pathways from surrounding states. It is established in the eastern US and has been found in several western states. To date, it has not been found in Wyoming. Two hundred eighty-one traps or survey sites have been placed or swept in thirteen Wyoming counties. 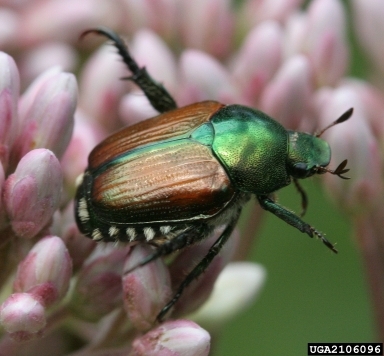 The Wyoming Japanese Beetle Survey was conducted by USDA APHIS PPQ from 2002 to 2011. A funnel trap with pheromone attractant or floral lures was placed in a potential risk area from June until September. The traps were collected and monitored for suspects at the end of the field season. CAPS still actively sweeps for Japanese beetle in wheat and barley fields.